Fascinating document illustrating Bruce's rediscovery of the source of the Blue Nile and his travels in the Red Sea. To The King. 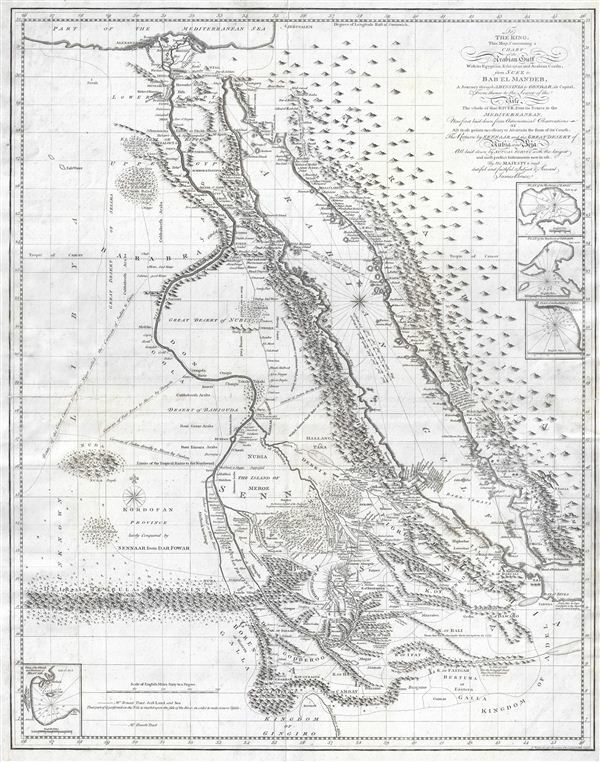 This map, Containing a Chart of the Arabian Gulf With its Egyptian, Ethiopian and Arabian Coasts, from Suez to Bab el Mandeb, A Journey through Abyssinia to Gondar, its Capital, From thence to the Source of the Nile, The Whole of that River, from its Source to the Mediterranean, Now first laid down from Astronomical Observations of All those points necessary to Aseertain the form of its Course, Teh Return by Sennaar and the Great Desert of Nubia and Beja All laid down by Actual Survey with the largest and most perfect Instruments now in use by His Majesty's most dutiful and faithful Subject & Servant, james Bruce. This is a fascinating, significant, beautifully engraved, intricately detailed 1790 map of Egypt, Abyssinia, and the Red Sea by the Scottish adventurer James Bruce. Centered on the Nile Valley, this map covers all of Egypt, Abyssinia, and the Red Sea from the Mediterranean to the speculative tribal Kingdoms of central Africa, inclusive of the Arabian coast as far as the Cape of Babelmandeb. The map plots Bruce's travels in search of the source of the Blue Nile. Starting in Alexandria, Bruce traveled south up the Nile as far as Thebes or Luxor before venturing overland to the Red Sea coast. There, disguising himself as a Turkish sailor, he navigated the Red Sea as far as the port city of Massawa, where he disembarked and journeyed inland to the Ethiopian capital of Gondar. From there local guides led him southwards to Lake Tana (Tzana) and eventually along the Abay River to Gish Abay, the source of the Blue Nile. Bruce claimed to have discovered the Gish Abay springs, but in a fact that he was well aware of, was merely retracing the steps of the Jesuit missionaries Pedro Paez and Jeronimo Lobo. Bruce then traveled northwards, following the Blue Nile to its confluence with the White Nile in Nubia, before following an overland caravan route to Syene and thence back into Egypt. Bruce's exploits were ridiculed in his day, but much of the information he collected worked its way into the cartographic corpus, appearing in later maps of the region by Cary, Thomson, Pinkerton, and others. Cartographically this map makes a number of advances and well as promotes a number of misconceptions associated with Bruce's theories. The course of the Blue Nile as well as much of the Abyssinian interior is meticulously mapped and, by and large, accurate. His mapping of the Red sea is equally impressive. Bruce's cartography becomes more speculative along the course of the White Nile and westward into Kordofan and Nubia. The White Nile itself is truncated with its source identified as mountain ranges in the Christian Kingdom of Caffa (Kaffa) - affirming Bruce's erroneous claim that the Blue Nile was actually the longer more important river. Further a fictional mountain range called the 'Deir and Tuggula Mountains' extends indefinitely westward from the White Nile. This range, postulated by the explorer Browne, appears in many late 18th and early 19th century maps and is most likely associated with speculations on the source of the Niger River. Many claim that this map and Bruce's explorations in Abyssinia also contain a subtext relating to his Masonic and Templar associations. Bruce's ancestor, the Scottish King Robert the Bruce, harbored many of the Knights Templar during their prosecution in the 14th century. Some believe that Bruce inherited secret knowledge that sent him to Ethiopia in search of Templar artifacts including, among other things, the Ark of the Covenant. Bruce himself remained silent on this matter – which is perhaps as telling as not – but to this day many, including most Ethiopians, strongly believe that the Ark resides in the Coptic sanctuary of Axum, which Bruce indeed visited. Engraved by J. Walker of Cavendish Square for James Bruce's five volume 1790 opus, Travels to Discover the Source of the Nile. First edition. James Bruce (December 14, 1730 - April 27, 1794) was a Scottish explorer, traveler, and nobleman active in the later part of the 18th century. Bruce's romantic adventures in North Africa and Arabia make a tale worthy of Hollywood. Descended from the great Scottish King Robert the Bruce, James Bruce was born at his family seat in Kinnaird, Stirlingshire, Scotland. He was educated in Law at Harrow School and Edinburgh University and, marrying into a family business, became a wine merchant. Following the 1762 war with between England and Spain, Bruce was sent to Algiers with a commission to study Roman antiquities in the region. Many adventures followed that eventually led Bruce to Alexandria, Egypt, where he determined to discover the source of the Nile, which he believed to be in Ethiopia. Bruce traveled up the Nile and, after visiting Luxor worked his way overland to the Red Sea port of Kosseir (Old Cosseir), where he embarked upon a merchant ship disguised as a Turkish sailor. In this guise Bruce made his way to Massawa, where is disembarked and, traveling overland via Axum, arrived at the Abyssinian capital at Gondar. From Gondar, local guides led Bruce southwards to Laka Tana, and then along the Abay River to the Gish Abay springs, the legendary source of the Blue Nile. Bruce believed that the Blue Nile was the Nile of antiquity and claimed, falsely, that it was the larger of the two Nile tributaries. In his narrative Bruce further announced that he had discovered the source of the Nile, while in fact, the first Europeans to visit Gish Abay were the 16th century Spanish Jesuit Pedro Paez and, later, the 17th century Portuguese Jesuit Jeronimo Lobo. On his return journey, Bruce followed the Blue Nile to its confluence with the White, becoming the first European to visit the site. Bruce's explorations were significant and, on his return to Kinnaird, he published a lavishly illustrated narrative of his travels in five volumes. Bruce's tales of Ethiopian architecture, culture, and life where heavily ridiculed by the scholars of this day. Modern researchers, however, have proven that much of Bruce's narrative was substantial and accurate, thus affirming his significant contribution to the cartographic corpus. Snubbed by his peers, Bruce retired to Kinnaird, where he remained until his death in 1794. Modern day conspiracy theorists have added an interesting twist to Bruce's Ethiopian adventures. They claim that Bruce had a second, more important motivation - to rediscover ancient Templar secrets and artifacts hidden in Ethiopia. Some believe that Bruce, having inherited secret Templar knowledge from his ancestor, Robert the Bruce - who sheltered the Templars during their prosecution in the 14th century - was searching Ethiopia for the secrets of the Ark of the Covenant and other religious artifacts. Though Bruce kept silent on what he found, if anything, many Ethiopians maintain that the Ark of the Covenant is, to this day, kept at a sacred sanctuary in Axum. Bruce, James, Travels to Discover the Source of the Nile, In the Years 1768, 1769, 1770, 1771, 1772 and 1773, Five Volumes, (G.G.J. and J. Robinson, London) 1790. Very good condition. Original pressmark visible. Blank on verso. Some verso reinforcement on original centerfold. Overall a clean beautiful example.